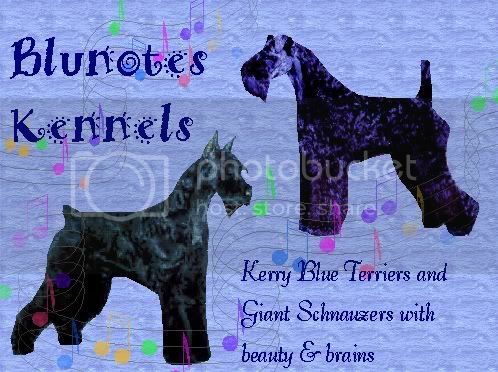 Breeders & exhibitors of quality Kerry Blue Terriers and Giant Schnauzers. Blunotes is very proud to have bred over 200 homebred champions! We strive for harmony of form & function, beauty & brains. Thank you for visiting! If you would like to use one of our males that is not listed for stud, please message to arrange breeding! Please e-mail requests and/or questions! By Blunotes Sun God out of Blunotes Disco Diva. By Blunotes Deney Terrio out of Blunotes Lady*s Maid. By Blunotes Light Em Up out of Blunotes Lavender Skies. By Blunotes Light Em Up out of Blunotes Long Distance. By Blunotes Valet out of Blunotes TGIF. By Blunotes Walking The Walk out of Blunotes Happy Wanderer. By Blunotes Walking The Walk out of Blunotes Lady*s Maid. By Blunotes Valet out of Blunotes Disco Diva. By Blunotes Mind Bender out of Blunotes Dancing In the Dark. By Blunotes Fly To The Sun out of Blunotes Lucky Charms.